Individuals with gout should avoid high-purine. Gout is a medical condition defined by the accumulation of uric acid that is formed by purines in foods. Purines are proteins found in certain foods and too many of them, along with other risk factors, can cause gout. Purines are found mostly in high-protein and high-fat foods. A person following a normal diet consumes from 600 to 1000 mg purines daily. A person restricting purines due to gout should consume 100 to 150 mg purines daily. Most seafood items are high in purines and should be avoided when possible if you have gout. High purine fish include anchovies, cod, herring, haddock, mackerel and sardines. These foods should be avoided if you have gout. According to New York University, high-purine foods contain 100 to 1000 mg purines per 3-oz. serving. The highest concentration of purines in fish is found in sardines. Choose instead other lean protein sources like poultry and pork. If vegetarian, choose dried peas and beans only twice a week due to moderate purine content in legumes. Moderate-purine fish include all other fish; there are no low purine fish. According to New York University, moderate purine foods contain nine to 100 mg purines per 3-oz. serving. Moderate purine foods also include red meats, legumes, spinach, mushrooms and asparagus. Individuals with gout should limit these foods to two servings or less per week. Choose canned salmon for the lowest purine content with 80 mg per 100 g serving. If you have gout, fish should not be part of the daily diet due to its purine content. High-purine shellfish include mussels, scallops, clams, squid, and shrimp. These foods contain between 100 to 1000 mg of purines per 3-oz. serving. They should be avoided if you have gout. Choose instead other lean protein sources such as poultry, pork, cheeses and yogurt. Always speak with your physician to determine what level of purines should be eaten each day depending on your particular condition. Moderate-purine shellfish include all others that are not listed as high-purine shellfish. They contain between nine and 100 mg purines per 3-oz. serving. 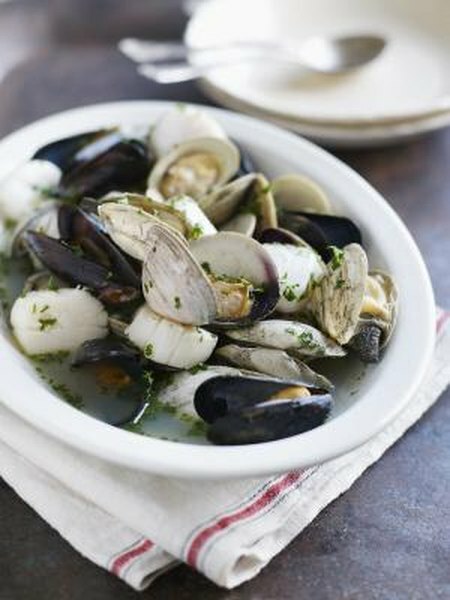 Canned clams have some of the lowest purine levels among shellfish with about 60 mg per 100 g serving. They should be limited to two servings per week or less if you have gout. All shellfish contain moderate or high levels of purines. If you have gout, shellfish should not be part of your daily diet.